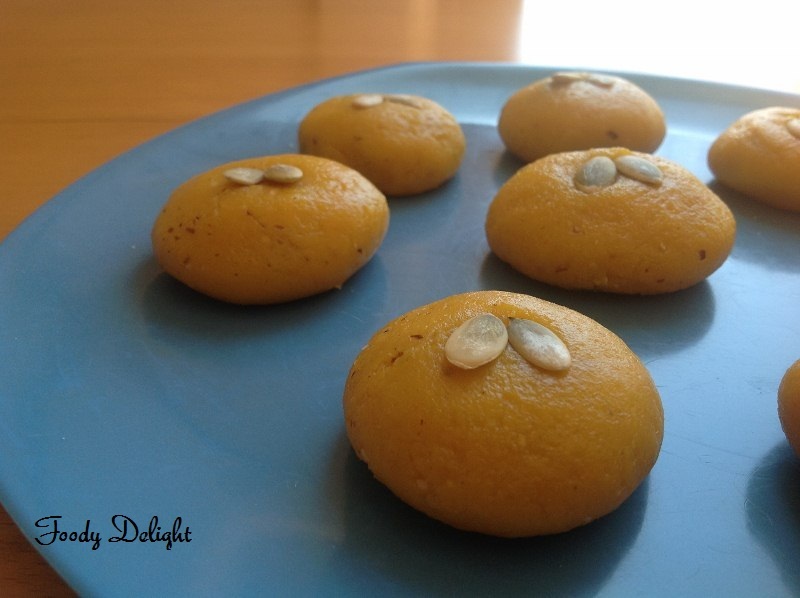 Mango peda is the Indian sweets that truly resembles kesariya Peda(another famous Indian sweets flavored with saffron). 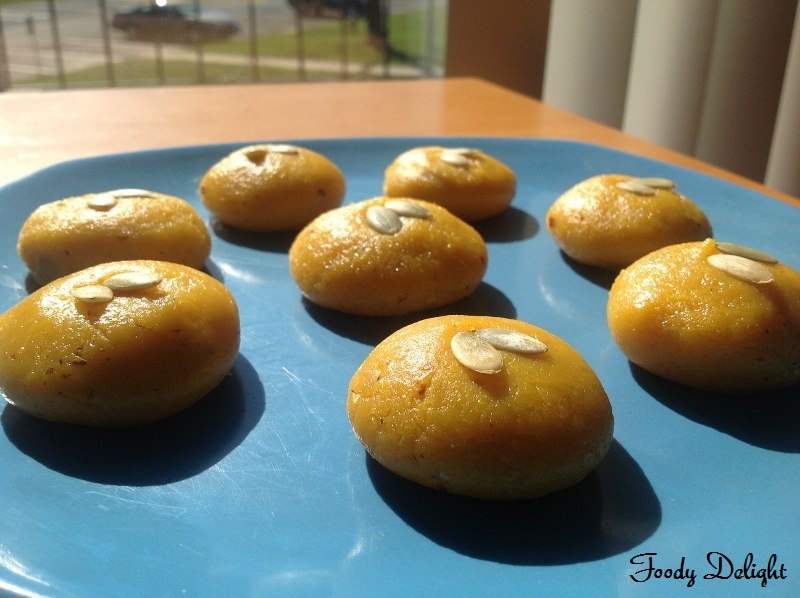 Mango peda is traditionally made by reducing milk in an open pan and then adding the required amount of mango pulp and sugar. A lot of people find very difficult to find Mawa/Khoya. So thought of giving quick tip for making Mawa and here is the recipes...!! Combine lukewarm milk and ghee in big bowl. To this add milk powder and mix well using ladle. If you find the mixture is still sticky, you can add some more milk powder. Mawa mixture should be be almost dry mixture. When the mawa mixture is dry, sieve the mixture using the colander and *wooden ladle. By doing this you will get very fine dry mawa mixture. which you can use for any type of Indian desserts. This will yield about 2 cups of dry Mawa mixture. * Wooden ladle is used to push the mawa mixture through colander holes. When ghee heats up, add dry coconut powder and stir well. Then add mango pulp and cook till the pulp bubbles up. Check the sweetness of the mango pulp.If required you can add sugar. I did not use sugar, my mangoes were very sweet. Add almonds powder and dry mawa mixture. Stir continuously till the mixture starts leaving the sides of the pan and becomes thick like a soft dough. Turn off the flame and allow the mixture to cool. 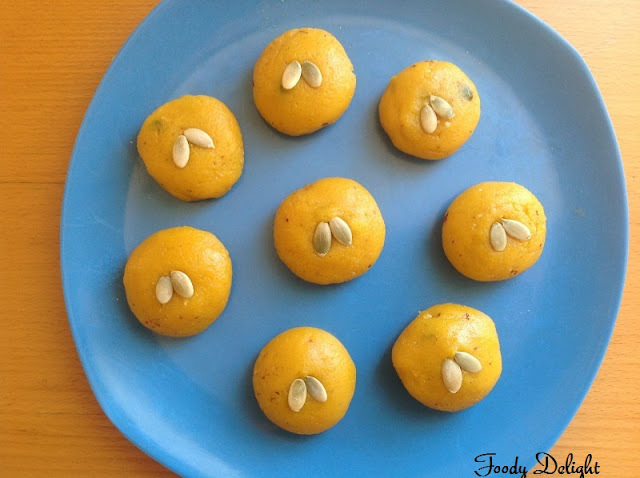 Apply the ghee on both of your palm and starts making small balls.Flatten the balls to give a look of the peda. Garnish the Mango peda with the pumpkin seeds on top. This will yield about 15 Mango peda. I'd love to try these, esp. as i love mangoes. So cute.. I love mango & I have never try this.. Should try one day.. TQ 4 d recipe. Looks yummy, I like the color, so pretty. wow. 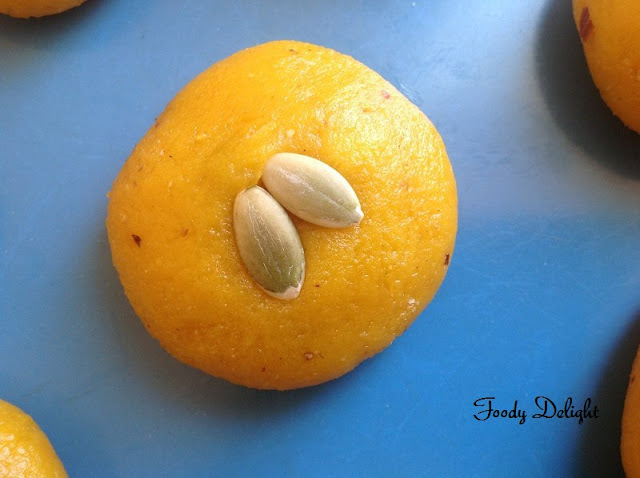 lovely mango flavored peda.